Welcome to our Early Winter 2017 Issue of South Shore Magazine. Greetings! I am writing this issue’s Publisher’s Letter just a couple of days before we turn the page on 2016. Personally, and in conversation with some of my peers, this has been one of the fastest years of my life. 2016 will be remembered as a year of transition and coming change, for sure. I am very proud to announce that 2017 begins the 17th year of publication of South Shore Magazine! I would like to thank my family, as well as Christine Orr, for your many years of dedication, hard work and encouragement to me and our business. I am truly blessed to have you all. 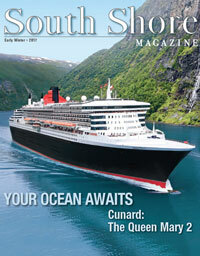 The early winter issue of South Shore Magazine is packed with exciting articles. The cover and feature article is about the most prestigious, classic and historic cruise line: Cunard. Their majestic ships, the Queen Mary 2, Queen Elizabeth and others hark to a bygone era. These majestic vessels, however, are everything that cruising should be, and that is with the emphasis on the cruise itself. In this case, that happens to be the Transatlantic crossings. Cunard and its ships serve as the pinnacle of service and quality in the cruise business. I had the pleasure of touring the Queen Mary 2 while in port in Boston this fall. This ship is luxurious in every aspect imaginable. Over the years, I have toured other ships that wow you with modern type amenities, which are very appealing to many, but the Queen Mary 2 was just stunning and so beautifully appointed. Enjoy this article, and consider booking your next vacation aboard a Cunard Ship! Another great article is on Bolt Depot. The Cazeault family, a long time South Shore business family, had transitioned their iconic, traditional family hardware store in North Weymouth into a mail order/Internet fastener business. Having originally started as being housed in the old store, the company’s rapid success and need to carry a higher level of inventory forced them to move to the Hingham Industrial Park, with a beautiful, state-of-the-art facility that happily employs nearly 50 people. It is the epitome of a great family business success story. This is what South Shore Magazine strives to show its readers. Kudos must go out to Caleb Blackmur for writing his first article in South Shore Magazine. For many years now, Caleb has been writing sports blogs for various outlets. Let’s see if his predictions for this year’s College Football Playoff National Championship Game hold true. Also in this issue, Erica Ford Sweeney keeps us laughing with her latest article. Our Great Tastes section features Rinato Bistro, a rebranding and makeover of the former Bridgeman’s, located along scenic Nantasket Beach. Harold Paine and his wife are passionate about food and service, and it clearly shows, in this great destination for dining here on the South Shore. The very talented musician Jay Psaros also keeps us up-to-date on the local and regional music scene with Volume 10 of The Beat. So, as year No. 17 begins for South Shore Magazine, I would like to again thank every business that has believed in our concept over the years. This magazine is brought to you free of charge by the businesses and advertisers featured on the pages of the magazine. Please let them know how much you enjoy learning about them and their businesses. We will continue to educate our readers about the many locally owned and operated businesses here on the South Shore, so that you can make a conscious effort to spend your money locally and help keep this wonderful place that we call home a vibrant and successful area. 2017 Early Winter Issue ~ READ NOW!